Consider the cutting options you have besides plain old scissors. At scrapbooking stores, you can find hole punches in all sorts of shapes, as well as scissors with patterned edges. You can also (carefully!) use a straight pin or sewing needle to poke tiny holes through the paper. Remember that you don’t have to make all your cuts with the paper completely folded up. Add some interest by partially unfolding your snowflake and making further cuts. Use the symmetrical properties of your folds to create recognizable shapes that are also symmetrical, from hearts and some letters to Christmas trees and even faces. Although snowflakes are white, paper snowflakes don’t have to be. In addition to using colored paper, you can add colorful highlights to your snowflake by coloring any cut edges with a marker before you unfold it. When you create a beautiful snowflake worth preserving, use a warm iron and a little spray starch to flatten out and stiffen your snowflake. 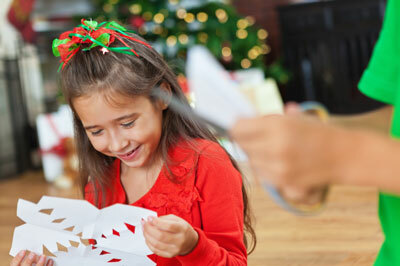 Make your paper snowflake sparkle like new-fallen snow with a little spray glitter from a craft store.